The organic Lemon Balm herb is immersed in a mixture of almond and apricot oils. The herbs soak in the oil allowing time for their herbal medicinal properties to be infused into the organic oils. This part of the process can’t be rushed as we want the optimal healing benefits of the herbs to be absorbed into the oils. The oil becomes a beautiful green, loaded with lots of healing power. We then strain the oil, and filter it through a series of fine strainers. Organic beeswax and and organic Vitamin E are added for their herbal healing benefits. Finally, organic 100% pure Lemon Essential oil is added as a natural preservative. Lemon Essential oi l is also anti-viral and anti-fungal. Lemon Balm is the number one herbal choice for the healing of herpes and herpes cold sores. 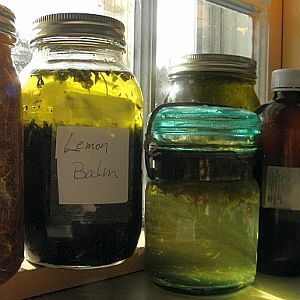 Lemon Balm should not be used by person who have thyroid conditions. Visit our site for an alternative. To purchase Melissa, Lemon Balm Ointment, and other lemon balm items securely online, please visit our secure online store. Sign up for updates, coupons and herbal information in your inbox. 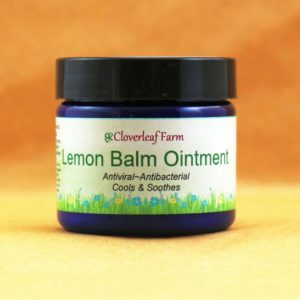 Learn more and securely request your lemon balm products from Cloverleaf Farm by visiting our Lemon Balm page.